If you’re flipping over the flipped classroom, you may also be looking for a tool that can record and broadcast real-time screencasts in your chosen platform (i.e. Skype, MSN Messenger, UStream) that you can use for capturing webcasts, tutorials, and more. PCWinSoft is offering readers of The Innovative Educator free licenses for ScreenCamera (normally $49.95) to do just that. 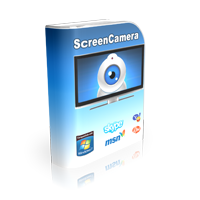 ScreenCamera enables you to choose to record a section of the desktop, the whole desktop, the area around the mouse cursor or an ‘exclusive window’. The exclusive window is where the program will continue capturing the chosen a Window even after it is not the active or the topmost one. ScreenCamera can also take snapshot images and it can also work as a normal screen recorder. Once you record the video you can save it on your computer. ScreenCamera works on PCs that have Windows 2000 and newer.